Posh defender Michael Bostwick is about to block a fierce volley by MK Dons striker Nicky Maynard. For 90 scary minutes it was easy to believe the ghost of Graham Westley had assumed control of Peterborough United. Numerous team changes which actually had a negative effect on recent performances (which themselves had been full of casual indifference) lead to a heavy home defeat and a chorus of boos from Posh fans, who clearly believe the season is about to fizzle out alarmingly, at the final whistle. Posh survived this goalmouth scramble during the heavy defeat by MK Dons. Photo: Joe Dent/theposh.com. Actually it’s probably time to stop blaming managers and instead wonder out loud just why Posh regularly fall spectacularly to pieces at the start of a new year. Manager Grant McCann had a theory which involved January transfer window hype and speculation, as well as busy agents out to make a quick personal killing. McCann is a decent man. He is passionate about his football club and deserves the chance to establish himself as a lower league manager. He doesn’t slink away from gruesome games like some. He faces the music, he accepts responsibility and he’ll organise a personal sleepover at the training ground if he believes it will help. But rookie bosses need extra assistance, not just from behind the scenes, but from highly-paid performers on the pitch. He received precious little of the latter today (January 28) against an admittedly impressive MK Dons outfit. The dejected figure of Posh full-back Michael Smith after the 4-0 home defeat by MK Dons. Photo: Joe Dent/theposh.com. MK started this game 10 points and eight places below Posh. When the final whistle blew on a well-deserved 4-0 away victory, few would have taken a bet against the positions soon being reversed. There has been a fierce rivalry which guaranteed a competitive contest when these two teams have met in recent seasons. Not today. Maybe the absence of a manager Posh fans loved to hate in Karl Robinson and the installation of what must be the two most softly-spoken bosses in football - McCann and Robbie Neilson - helped tone the rivalry down. For whatever reason, after a sprited opening, Posh ignored their manager’s pre-match plea to play risk-taking, brave football and instead performed passively until falling behind early in the second-half when they promptly surrendered. This wasn’t a one-off, Posh were meek in defeat at a very ordinary Oldham side in their previous outing and their last three defeats could all have been described as ‘embarrassing’, one of the many adjectives used by McCann after the game, all of them harsh, yet all of them deserved. Dons scored all four goals in a 25-minute period of complete dominance. How Posh fans looked on in envy at the array of attacking talent at Neilson’s disposal from the imposing figure of two-goal Chuks Aneke, through the quality of Kieran Agard and Nicky Maynard, to the free-spirited Leicester loanee Harvey Barnes who opened the floodgates here with a well-taken goal on 58 minutes - his second in just two games for his new club. Posh boss Grant McCann watches his side be outplayed by MK Dons. Photo: Joe Dent/theposh.com. Posh desperately need fresh faces capable of hitting the ground, not just running, but also with the ability to lift a few spirits. Midfielder Martin Samuelsen, a player on temporary secondment from West Ham, was given his chance in this game, but looks to struggle with the pace and physical nature of League One football. His confidence wouldn’t have been helped when he somehow missed Marcus Maddison’s precise cross 10 minutes before the break when stood inside the six yard box. Even Neilson admitted Posh scoring first might have made a difference to the game’s pattern. 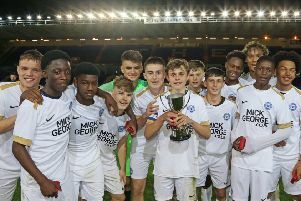 But Samuelsen’s miss and a second-minute effort from Lee Angol which Paul Downing booted off the line were pretty much it for Posh until a late strike from distance from substitute Gwion Edwards dribbled into visiting keeper David Martin’s hands and drew ironic applause from the irritated home crowd. Posh were 4-0 down by then. Barnes’ neat finish was followed by a smart strike into the corner of the net from Agard, a sensational smack from distance by Aneke who then completed the scoring after a neat piece of skill baffled two defenders. Defensive blocks from Michael Bostwick, Ryan Tafazolli and Jerome Binnom-Williams had helped protect Posh ‘keeper Luke McGee for most of the first hour. With Paul Taylor enduring one of his maddening afternoons of jet-heeled sprints followed by clumsy passes, and with Posh playing so slowly and with so much apparent fear, centre-half Tafazolli seemed to have the ball permanently at his feet in the first-half, Maddison, playing exclusively in a wide right position, was the sole attacking hope. But Posh failed to get the ball out to him often enough. Posh ditched the midfield diamond today and ended up losing heavily to a team who employed it rather effectively. Who really believes formations are more important than the form of the players themselves? With the lack of passion, intelligence and fight shown today, Posh could have played 4-4-2, 3-5-2, 4-3-3 or 10-0-1 and still lost badly. heck they could have stuck all 18 players on the pitch at the same time and still lost. This result will hopefully be Posh hitting rock bottom. It can’t be a bad thing the next game takes place in February. Posh: Luke McGee, Michael Smith, Jerome Binnom-Williams (sub Junior Morias, 74 mins), Ryan Tafazolli, Michael Bostwick, Leo Da Silva Lopes, Chris Forrester (sub Gwion Edwards, 66 mins), Marcus Maddison, Martin Samuelsen, Paul Taylor, Lee Angol (sub Tom Nichols 66 mins). Unused substitutes: Mark Tyler, Brad Inman, Callum Chettle, Dominic Ball..
MK Dons: David Martin, George Baldock, Harvey Barnes (sub Robbie Muirhead, 73 mins), Joe Walsh, Paul Downing, George Williams, Ed Upson, Darren Potter, Kieran Agard (sub Daniel Powell, 84 mins), Chucks Aneke (sub Callum Brittain, 88 mins), Nicky Maynard. Unused substitutes: Lee Nicholls, Dean Bowditch, Georgio Rasulo, Ben Tilney. Goals: MK Dons - Barnes (58 mins), Agard (72 mins), Aneke (74 mins & 83 mins), Walsh (foul). Cautions: Posh - Tafazolli (foul). MK Dons: Baldock (foul), Williams (foul), Potter (deliberate handball), Walsh (foul). Attendance: 6,617 (685 MK Dons).